BearsFootball | Bring Your "A" Game Sports Talk! All of those hoping to hear Cutler talk about his former team had their dreams dashed when an injury occurred to Miami Dolphins signal-caller Ryan Tannehill during the summer. Dolphins head coach Adam Gase worked with Cutler in 2015 in Chicago and called upon his former QB for some help. On August 3, Cutler signed with the Dolphins, casting aside his television booth dreams. He signed a one-year deal and was named the team’s starter for Week 1. In 14 starts for the Dolphins he completed 62 percent of his passes for 2,666 yards with 19 touchdowns and 14 interceptions. As a starter he went 6-8. 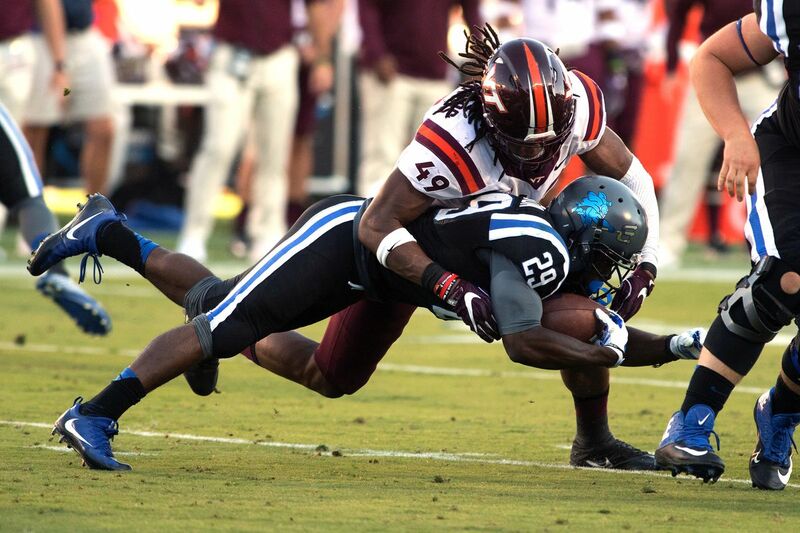 Would Ryan Pace select Virginia Tech LB Tremaine Edmunds with the 8th overall pick? The Chicago Bears spot at eight is an interesting one. It seems that seven names have emerged above the rest: the four quarterbacks, Quenton Nelson, Saquon Barkley and Bradley Chubb. If the draft doesn’t have any surprises, it’s likely that those seven names are taken before anyone else. If that’s the case, the Bears at eight will have plenty of options from the next tier down. One of those names is Virginia Tech linebacker Tremaine Edmunds. Could he be Ryan Pace’s selection? It’s definitely a name you would think he would consider. Edmunds has a rare combination of size and speed that you just don’t see in linebackers. He checks in at 6’5, 250 lbs and he can run a 4.5 40-yard dash. Edumunds probably needs to add more strength, but he has the frame to do it and if he does, he could be a scary man on the football field. Some scouts say that teams should take Edmunds and move him to the edge position and have him focus on rushing the passer. While taking an edge position makes more sense in the top ten than an inside linebacker, is it a good idea to take the 8th pick and instantly move him to a position he’s uncomfortable with? The question about Edmunds is his instincts. He is such a gifted athlete, he’s never had to rely on quick reads. If he’s a step slow reacting, he has always been able to use his speed to close the gap. Will that work at the NFL level? It does for some, but gifted athletes have to reach rare air to make up for poor instincts at the highest level. Edmunds has also struggled at times in pass coverage so by no means is he a perfect prospect but he does fit that Pace profile of a player with massive upside that could develop into a dominant force. Pace’s first-round pick (Kevin White, Leonard Floyd, Mitch Trubisky) have all been the same thing- massive upside guys that are borderline projects. He wants guys that can potentially reach the moon and become difference makers. He doesn’t want high-floor, low-ceiling guys in round one that will almost certainly be good, but don’t have the potential to be special. The biggest issue with the selection of Edmunds is the need at inside linebacker. With Danny Trevathan and Nick Kwiatkoski, it’s not exactly a position of need (although depth at the position is needed badly). But at the same time, when you are picking in the top ten, you shouldn’t be picking to fill holes on the roster, you should be picking the absolute best player available and fill your roster with talent. Filling holes is how teams miss on talent and end up picking in the top ten year after year. Edmunds fits the Pace profile but he doesn’t fit a position of need or a position that usually warrants a top ten selection. Will Pace see Edmunds size and speed and massive potential and take the plunge? It’s unlikely Edmunds goes in the top seven, so if Pace wants him, he should have him available when the Bears are on the clock.